In 2013, Nigeria accepted 10 recommendations relating to civic space with a view to strengthening the Nigerian civil society. LAGOS, Nigeria, June 6, 2018–The Nigeria Network of NGOs, NNNGO engaged CSOs in an advocacy strategy to appraise the implementation of past recommendations of the Universal Periodic Review (UPR) and contribute to Nigeria’s submission in the forthcoming review. The first human rights mechanism to ever achieve 100% participation, twice, by United Nations (UN) member states, the UPR was established in March 2006 by the Human Rights Council (HRC) with the aim of improving current human rights situation in each of the 193 UN member states. It allows a review of the human rights situation of all UN Member States every 5 years with 42 States undergoing the review each year during three Working Group sessions dedicated to 14 States each. The result of each review is reflected in the Final Report of the Working Group, which lists the recommendations the State under Review (SuR) will have to implement before the next review. What makes the UPR especially unique is the inclusion of the civil society such that CSOs are allowed to advocate and take part in implementation of human rights obligations. Thus, a workshop was necessary in order to share outcomes of findings on the 10 recommendations on civic space, the contributions of civil society actors and recommendations as submitted jointly by CIVICUS and NNNGO. 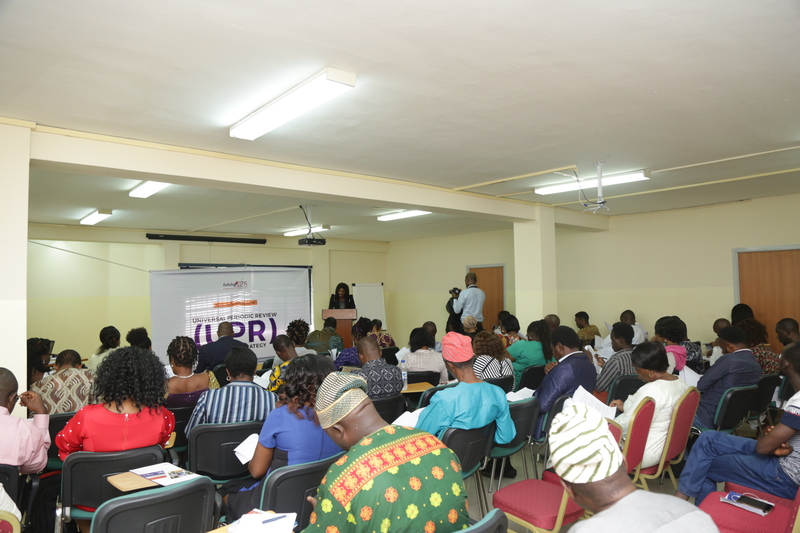 Participants who comprised seventy-one Nonprofits dialogued at the UPR advocacy strategy workshop in view of examining the Nigerian Government’s compliance with its international human rights obligations to create and maintain a safe and enabling environment for civil society. “Specifically, we analysed the Government of Nigeria’s fulfillment of the rights to freedom of association, peaceful assembly and expression as well as unwarranted restrictions on human rights defenders since its previous UPR examinations in October 2013 and noted gaps in the implementation of these recommendations” noted Ms. Chidinma Okpara, the resident UPR researcher for NNNGO. In light of providing action-oriented follow-up recommendations, participants at the break-out session during the workshop identified areas of concern, broad goals and specific objectives founded on realities and challenges faced by nonprofit organisations in Nigeria. According to one of the participants, “one of the challenges we face in the clamour for the implementation of these recommendations is inaccessibility to decision-makers, especially as the submission comes up around the same time as the primary elections.” Another participant also identified challenges of inadequate funding and unavailability of concrete data on human rights situations in the country as obstacles to the actualization of the goals. However, many participants affirmed that the upcoming 2019 elections may serve as a veritable opportunity that civil society actors could leverage upon to assure that the challenges are mitigated. Broad goals, targeted at ensuring that the Federal Government of Nigeria implements the 10 recommendations by October 2023 with the ultimate aim of achieving the promotion and protection of fundamental human rights in compliance with the international human rights obligation were aligned with specific objectives. These objectives were identified as key to the actualization of the goal; such as, creation of public awareness on the 10 recommendations through the media and local community outreaches, strengthening the Nigerian UPR coalition by actively engaging civil society actors in the review process, liaising with the human rights committee at the legislative arm to ensure the amendment of relevant bills and ensuring that CSOs are engaged in the UPR process before the government submits its report.